This 3 bedroom log home is very secluded on a wooded lot. There is a wood-burning fireplace in the living room (in season), full kitchen with open dining area, 2 bathrooms, lower level family room with dart board, and central air conditioner. Enjoy the screened-in porch and deck with a charcoal grill. This pet-friendly home has satellite TV/VCR/DVD, new stereo system and WIFI. Hike through the woods to the Lemonweir River to enjoy the screened-in gazebo or fire pit or canoe in the river weather permitting. 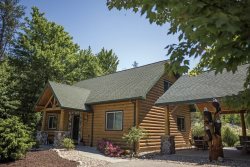 This is an ideal home for those who want to relax, yet it's only 20 minutes from downtown Dells. George and Marci are always extremely friendly, knowledgeable and accommodating. Happy Heaven is a delight. It's secluded, cozy and has everything that you may need. If you like a cabin, northwoods setting away from it all, this is the place to stay! It snowed approximately 6 inches during our stay and it was a magical weekend grilling out and enjoying the fireplace Sand County always fulfills ANY request with a smile and often goes above and beyond. They were great. Marcy is great. It was amazing! I will definitely be back. Great location for us! Very peaceful and inviting! Fabulous staff. So helpful. Just lovely people in person, on the phone, and via email. Really a joy. It was a lovely getaway. We found our way to & from the property, but it would have been nice to know where we were located as we could not figure it out. We know we were "near" Mauston, but needed a nice small map to show us where we were in relation to the various routes going in and out of Mauston. We enjoyed the fireplace, and it was nice having 2 bathrooms. Nice kitchen table and a good place to sit and talk. A lot was furnished in the way of dishes, pots and pans, utensils, and a nice-sized fridge and working stove & oven. Thank you. Your staff was very friendly and extremely accommodating to me and my payment options. I would love and be honored to stay in happy Haven or one of your other condos. Easy website to chose from. Easy process to book. Very nice staff. Very accommodating. House has everything you need. Price is great. Area is quiet and secluded. Very relaxing. I've been a Sand County customer for the last 7 years for all my winter weekend get away road trips. Thats how much I'm plesed with their service. I shouldn't recommend this home. I dont like having a hard time finding it available.The home has been the same one for the last 5 years. I used to stay at whatever home was available but since the first time we staied at this one we accommodate our schedule to its availability. Thats how much we love it. Very attentive and helpful I needed a place to work since most of my work is over computer they offered me their office to use .. very much appreciated ..
A perfect family getaway experience, our family loved the cottage tucked into woods surrounded only by sounds of nature .. even a whole day of rain did not ruined our stay we ended up sitting around the porch and playing family games and sharing stories..
always pleasant and helpful. very nice and courteous and informative. Everyone was so accommodating and friendly. It made the process of getting there and into the cabin so stress free. Loved happy heaven. We will certainly be back when we have more time to enjoy the outdoors. The property was everything I expected it to be. Great place for the family to enjoy cook outs, fire pit, and Dells attractions and theme parks. The greeting from the team was friendly and prepared. Check in was quick and easy as well as enjoyable. When we called to ask about a late checkout the person we spoke with was so kind and friendly. Every interaction we had with the members of the team was completely professional and fantastic! The property was nothing short of perfect. We walked in and were absolutely thrilled with the amenities as well as how much space there really was. This cabin slept 8 people with absolute comfort and we had more than enough room to move around and enjoy ourselves. The surround area is beautiful and secluded and the river was gorgeous. We were so pleased with every second of our stay from check in to check out. I will absolutely be staying with sand county again as well as recommend it to anyone I know who is looking for a great vacation getaway. So grateful. May you hsvr a prosperous new year. theyve been very friendly and accommodating. they're not hesitant to answer our questions! This is actually the 2nd time we've been to the Happy Heaven property. some of my friends who referred us has stayed there for the 3rd time. we always keep coming back because its a very cozy place. its beautiful and its pet friendly. (although we didnt have any dogs this year) its very spacious and we got everything we need! thank you so much for letting us stay again! Thank you for your friendly, helpful service! We especially appreciated the recommendation of a vegan restaurant (as well as specific items to order on the menu), the discount tickets to Kalahari, and the helpful instructions given to us by everyone. (The 3rd night free also was spectacular many thanks to George for mentioning that deal to us!) Thank you again for a wonderful stay we absolutely will be back!